I saw this and thought mmh! 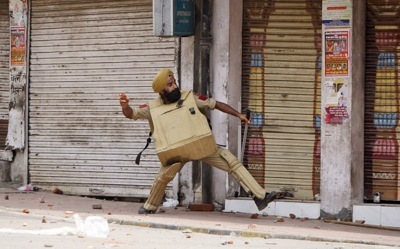 Kashmir police demonstrate new a tank. Mmmh! What a creative use of Cardboard and Cricket pads. It’s obviously that the Indian’s are the world leaders of the future isn’t it! Although everyone has stopped talking about that these days haven’t they! I wonder why, although I suppose the picture tells the story.